On February 05th 2016, H.E.Dr. Aun Pornmoniroth, Senior Minister of Ministry of Economy and Finance, has approved the formalization of “Standard Operating Procedures for Procure to Pay Processes”. This is one of the achievements for FMIS implementation that plays important role to guide all stakeholders about business flow starting from Procure to Pay Processes in order to eliminate and facilitate some of the workflows that have not been added value, as well as to improve efficiency and productivity in FMIS implementation. The Department of Information Technology of FMIS Management Working Group (FMWG) will formalize these SOPs to relevant General Departments and Line Ministries. At the same time, FMWG will continue to coordinate the development of remaining SOPs with other General Departments and to support the use of FMIS to all users. 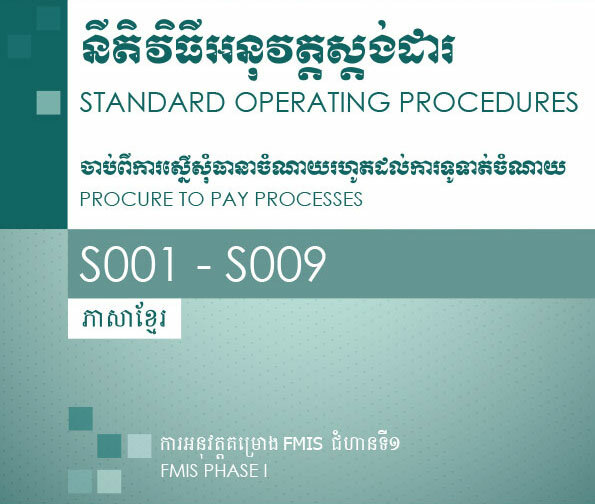 FMIS is foundation for all platforms in the Public Finance Management (PFM) Reform Program that has been set forth and committed by the leadership of MEF, line ministries, development partners and the Royal Government of Cambodia.